"My Friend woke up to this thing fighting his dogs." Redditor treemonkey18 posted this image with the simple quote: "My Friend woke up to this thing fighting his dogs (Yes i'm from Australia)." UPDATE: The redditor later added that, "He [the friend] didn't kill it the dog did, he is just holding it wit a stick because he didn't want to touch it." UPDATE: Many of you have contacted me to inform me of this animal's lifestyle and habitat and I thank you for that. 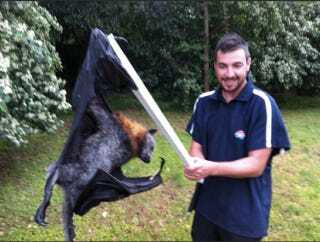 I'm still not certain if this picture is real but if this species of bat is endangered this is horrible. We don't condone killing this creature in any way.